I had the good fortune to attend today's game with three of my friends. We had sweet seats and the weather was phenomenal, considering it is April 18th. The game itself was riveting. Ryan Dempster pitched poorly, and the Cubs were in come-from-behind mode early on... then they got the lead, lost it, tied it up, and finally won the game with a walk-off home run by Aramis Ramirez. 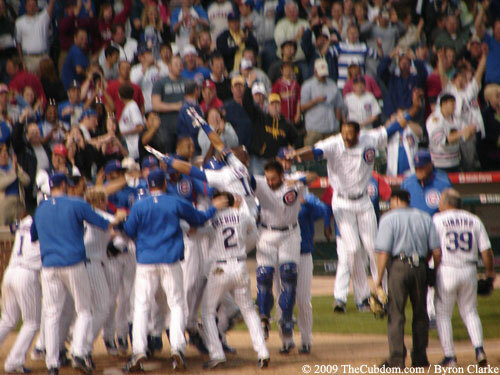 Wrigley shook as he rounded the bases and leapt into his teammates arms at home plate. Aramis Ramirez leaps toward home plate as his teammates celebrate his 11th inning walk-off home run to beat the Cardinals 7-5. 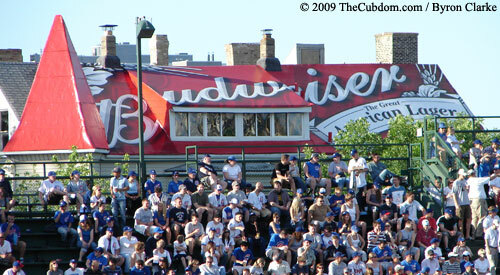 What happened to the Budweiser Building? If you're like me, opening day is always terrific. This year, I played hooky from work and spent mine watching the game from the Wrigley Done Right rooftop across the street. In between burgers, brats, beer, and women (who am I kidding? ), my friend and I watched Ted Lilly take a no-no deep into the sixth. Sure, the weather was miserable, but we had a blast regardless. Anyhow, as I was taking in the majesty that is Wrigleyville, I noticed a massive new advertisement for the Horseshoe Casino where the old Budweiser building used to be. I had heard rumors last year that their 20 year deal was up, but the sight of black and gold urging me to throw my money away at a gaming table was not nearly as pleasant as the red and white urging me to throw my money away on beer. In 2009, the old Budweiser advertisement on top of this apartment building was replaced with a new advertisement for Jack Binion's Horseshoe Casino. So, like the seasoned journalist I'm not, I googled the ad change and here's what I found. Keith Levy, vice president of marketing for Anheuser-Busch, said the brewer decided to stop paying for the signage because A-B continued to have a strong presence in the stadium without it and because the building owner's asking price "far exceeded" what A-B was willing to pay for it. He declined to specify the dollar amount. But it turns out that's only half the story. Sure, the rooftop owner jacked up the price during the middle of the recession (and apparently found a buyer)... but possibly not everything was so rosy between the rooftop owner and Budweiser. In September, Anheuser-Busch sued the building's owner, Tom Gramatis, after he covered up the sign with a tarp. Gramatis said he covered the sign because the brewer was allegedly late in paying him, a claim A-B denied. A judge ordered the tarp's removal. The Budweiser Building photographed June 10, 2008. 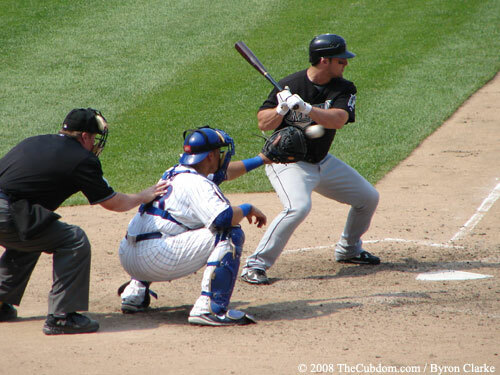 Comcast SportsNet Chicago is reporting that Geovany Soto will miss the next two or three games. He strained his shoulder on Tuesday, sat out Wednesday, and saw the team doctor in Chicago today. As a follow-up, the Pirates lost today leaving the Cubs in sole possession of the NL Central division lead. 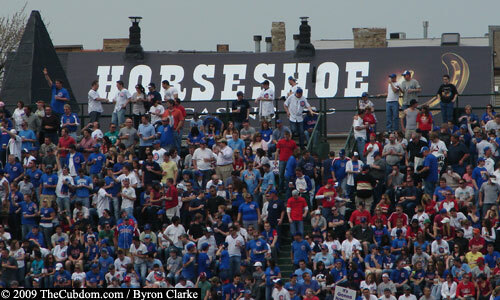 One of my hopes for the Cubs' 2009 season is to go wire-to-wire in first place this year. I think it's a reasonable possibility as the Cubs are (on paper) far stronger than the rest of the division... it's also greedy as I'll get out, but hey: I don't care. Now, for any team trying to go wire-to-wire, the toughest part of the schedule is the first few weeks. Great teams need time to put some distance between themselves and the pretenders... so it's imperative to get off to a fast start. Anyhow, the Cubs started the season with three solid games against the Astros, but only two wins. Cy Zambrano pitched six innings on opening day, got the victory, and watched as Kevin Gregg picked up his first save, even if it was quite rocky. The day finished with the Cubs tied for first at 1-0. On Tuesday, Ryan Dempster drew the short stick. He pitched six, gave up two runs, but left the game looking at a loss due to shoddy run support. Fortunately for Demp, Alfonso Soriano came through with a solo dinger to tie it up, only to watch as Neil Cotts surrendered the loss in 10 innings. Despite the stumble, every other Central division team had lost one at that point, so we finished Tuesday in a four way tie for first. On Wednesday, the Cubs jumped all over Brian Moehler - scoring four in the first, and another four in the second. This allowed Ted Lilly to throw strikes all night in a come-and-hit-it fashion... which is just what the 'stros did. Lilly surrendered five runs in five innings, but thanks to the generous run support, he walked away with his first W of the season. David Patton relieved Lilly in the sixth, and promptly gave up a home run on a 3-1 count to the first batter he faced as a big-leaguer. As Hunter Pence circled the bases, Derrek Lee and Ryan Theriot visited the mound to tell Patton to calm down... and Patton did. Six outs later, Patton's ERA was down from infinity to 4.5, and the Astros' offense was done for the night. The final score was 11-6, and the Cubs finished the night 2-1, tied for first with Pittsburgh. Today is the first choke-point for the Cubs' wire-to-wire hopes. Pittsburgh and St. Louis are playing, and a win would put the Pirates a half-game up on the Cubs... but a Pirate loss will deliver the Cubs their first day in sole ownership of first. Here's hoping for a Pirate smackdown! Don't miss the excitement at the Les Turner ALS Foundation's 15th Annual Lou Gehrig Day at Wrigley Field on Sunday, July 26. The event begins at 11:00a.m. with a two-hour pre-game party at the Vic Theatre emceed by 93XRT's Lin Brehmer followed by a 1:20p.m. match up between the Chicago Cubs and Cincinnati Reds at historic Wrigley Field. Guests will enjoy unlimited food and beverages provided by Lou Malnati's Pizza and Goose Island Beer Company, an exciting raffle and live auction and a terrace reserved ticket to the game. One lucky auction bidder will throw out the ceremonial first pitch at the game and four attendees will have their photograph taken in Wrigley Field's on-deck circle. Inquire about premium seating packages. Tickets can only be purchased by contacting 847-679-3311 or by visiting www.lesturnerals.org. All proceeds benefit the Les Turner ALS Foundation. 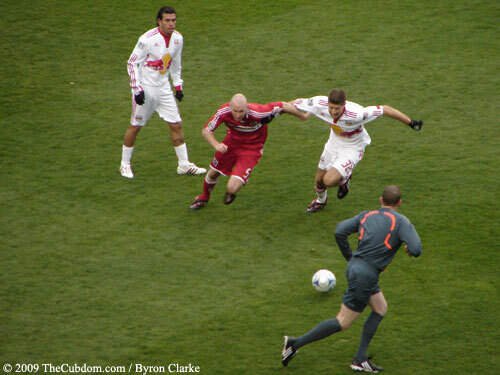 April 5, 2009 - The Chicago Fire take on the New York Red Bulls at Toyota Park. The match got off to a poor start when John Thorrington was given a red card in the 14th minute for a hard tackle from behind on Macoumba Kandji. The tackle definitely deserved a card, but the color was wrong... and to add insult to injury, referred Tim Weyland had missed a clear hand-ball seconds before the play (which incidentally sprung the attack that forced Thorrington's tackle). Anyhow, with the Fire playing short-handed, I was thinking about last year when the Fire went to NY, the Red Bulls were red-carded early in the match, and the Fire went on to win 4-0. Fortunately, the Fire's defense was solid, and John Busch recorded his first clean sheet of the season. 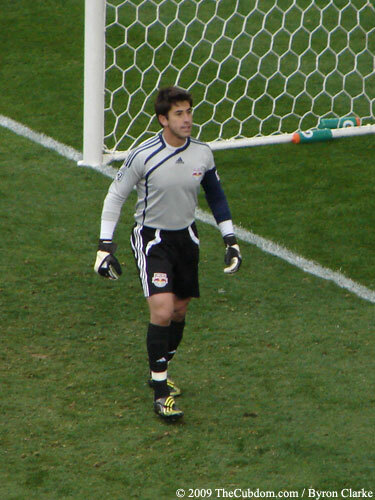 The Fire scored when Marco Pappa was able to get off a clear shot from approximately 17 yards out. The ball hit off the left post, ricocheted to the right post, and barely tucked into the net before bouncing out of the goal. Of note, Chris Rolfe was again subbed in during the 70th minute. Cuauhtemoc Blanco did not play... and I don't believe he's injured. Austin Washington also saw time as a late sub for Pappa.